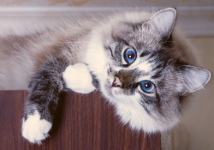 We offer a traditional style boarding cattery built to Feline Advisory Bureau standards. Nestled up a private road in a secluded rural location it is a peaceful haven which is however only a few convenient minutes from Fareham and the M27. We have been offering caring, luxurious boarding for cats at a competitive price for nearly 30 years! Our current charges are £8 per day for one cat with discounts for more cats from one family sharing. We welcome potential customers to view our cattery but please telephone to make an appointment so we can give you our attention. We have twenty nine large fully insulated chalets and four large family units each individually heated and thermostatically controlled. Each of the chalets has its own large covered run which is separated from its neighbour with two foot gaps to prevent transmission of germs. Each Chalet and run looks out over the central pond and garden giving your cats a stunning and interesting view and all the fresh air they wish for - if they are feeling shy or the weather is bleak they can snuggle up in their cosy heated chalet and look out of their windows. Our staff are veterinary trained to administer all medications to the cats staying with us. we are fully licensed by Fareham Borough Council.